John Ratliff and his associates requested that Pima County rezone a 4,000-acre parcel of land lying east of U.S. Highway 89 (Oracle Road), north of Tucson in the early 1970’s. The property known as Rancho Romero was located adjacent to the western slopes of the Coronado National Forest’s Santa Catalina Mountains. The proposed development included a variety of housing units that would accommodate 17,000 people, which would surround golf courses along the Canada de Oro and Sutherland Washes. When this rezoning request came before the Pima County Planning and Zoning Commission, there was so much opposition from the public that the proposed plan was put on hold. The people of Tucson preferred the preservation of this area as open space, with developed recreational facilities. Shortly after this action, a letter was sent to State Parks from Representative Charles King of Tucson requesting staff to initiate a feasibility study on the Rancho Romero property. At the October 5, 1973, meeting, the Parks Board, was advised that the Chairman of the Pima County Board of Supervisors, Ron Asta, was creating a special committee called the Oracle Road Green Belt Committee, and had requested a delegate from State Parks. The Board selected Ricki Rarick to serve as a representative with Director McCarthy as his alternate. The Board also directed staff to prepare the feasibility study on the Rancho Romero property for presentation in six weeks. 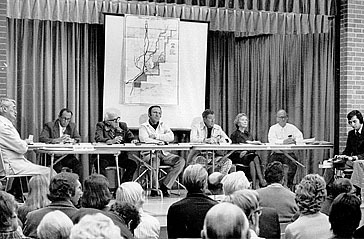 At the meeting of the Parks Board held on November 19, 1973, the Director advised the Board of the activities of the Oracle Road Green Belt Committee, and staff presented its finding from the feasibility study on Rancho Romero. The feasibility study indicated this specific area would meet the criteria for a State Park. As a part of this discussion, the potential for a State land exchange was explored. The Board took no action on this report. At the December 10, 1973, meeting of the Parks Board, the Director presented the Board with additional written material and a verbal report concerning the status of the Rancho Romero project. After considerable discussion on the desirability of acquiring Rancho Romero and adjacent properties, the Board, by majority, voted to go on record against the establishment of a State Park at Rancho Romero. Through the efforts of the Rancho Romero Coalition, an interested citizen’s group from Tucson and an outgrowth of the Oracle Road Greenbelt Committee, and other action groups, Representative Charles King introduced House Bill 2280 early in the 1974 session to establish Catalina State Park. During legislative hearings, State Parks staff was asked to give presentations that supported this legislation. There were times State Parks staff was sent to the field so they would not be available to testify before the legislative committees. Representative King became so frustrated with the Parks Board that he strongly considered legislation to abolish the Board. However, the Catalina State Park legislation, House Bill 2280, passed and was signed by Governor Jack Williams on May 1, 1974 as Chapter 65. Included in the bill was authorization to acquire over 13,000 acres of lands in both Pima and Pinal Counties. The legislation authorized the State Land Department to obtain any of the described lands through exchanges for state land of equal value. Shortly after the legislation passed, Dr. Stanley K. Brickler, Professor in the School of Renewal Natural Resources at the University of Arizona, met with State Parks Director, Dennis McCarthy, and offered the services of one of his classes to develop a master plan for Catalina State Park. Dr. Brickler secured the approval for the class to work with the Agency’s planning staff to develop the plan. The Natural Resource Planning 224 class began its research at the beginning of the fall term. The class members initiated the process by meeting with State Parks Planning staff, Charles Eatherly, Chief of Planning and Allen Gross, Resource Planner, to discuss the scope and possibilities of the project. The students worked throughout the semester researching, compiling, analyzing and developing a master plan for the proposed park. The students, Patricia M. Bergthold, Robert W. Cordts, Dennis P, Donovan, Steven C. Flint, Jeffery P. Hogg, Charles Jankiewicz, Stephen E. Knox, Brent E. Martin, Jon Dorsey Marting, Stephen P. Martin, Patrick L. McKee, David Paul Murbach, Philip S. Parkhurst, William J. Ragsdale, Terry D. Shand, Gary S. Shellhorn, Robert K. Taylor, Tanna Thornburg, and John E. Wraight, Jr., presented printed copies of the master development plan for the future Catalina State Park to State Parks and Pima County officials in December 1974. After review of the student’s park master plan, evaluating numerous alternatives and working closely with the Rancho Romero Coalition, the Parks Board delineated a potential park boundary that included 8,430 acres. The Parks Board took this action in the December 12, 1975, meeting in Tucson. The lands delineated by the Parks Board included 3,030 acres of State Trust land, 2,654 acres owned by Pima County, and 2,746 acres of private land. In 1976 after Michael Ramnes became Director of State Parks, he appointed a citizens’ planning committee to review the plan that was done by the University of Arizona students and assist staff in developing a new master plan for the Park. The members of the Catalina State Park Planning Committee represented a wide variety of interest groups and backgrounds. The primary leaders of this Committee were Betsy Rieke, MaryBeth Carlile, Priscilla Robinson, and Doug Shakel. Following numerous public meetings to review the proposed draft master plan, the Planning Committee endorsed the plan for presentation to the Parks Board. The State Parks Board reviewed and approved the Catalina State Park Master Plan at its meeting on December 9, 1977. Two land exchanges involving sizable acreages within the Parks Board’s delineated boundary were initiated with the State Land Department. These proposed exchanges included the Ratliff-Miller-Muhr application to exchange 1,896 acres and Pima County’s application to exchange its 2,654 acres. The consummation of these land exchanges would place the major part of the property desired for the park in the ownership of the State Land department. In order to have the funds necessary to lease these lands, the Parks Board requested the funds in its 1978-1979 Operating Budget Request. The balance of the land consisted of 850 acres of private property held by 30 owners, 2,950 acres of State land leased to four parties and 80 acres of unleased State land. The Legislature appropriated $982,000 to State Parks during the 1978 session. The funds were to be used to acquire leases on State land and purchase private property within the designated Park boundary. To continue the implementation creating Catalina State Park, the agency filed an application to reclassify and lease State land within the boundary. The State Land Department reclassified the land but the lessee, Lloyd Golder, III, filed an appeal. During this same time, the land exchange for the Ratliff-Miller-Muhr property was completed and State Parks filed an application to lease the 1,889 acres of State land. The Parks Board also authorized the Director to pursue negotiations with Mr. Golder to acquire 175 acres of his property. Mr. Golder, by letter, declined the State’s offer to purchase his land. 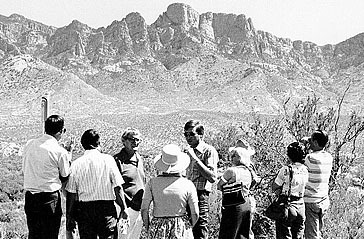 In March of 1980, Director Ramnes established the Catalina Land Selection Committee to assist the Parks Board in evaluating the private land within the Catalina State Parkdelineated boundary and to make a recommendation to the Parks Board on what lands should be acquired and in what priority. This Committee met in Tucson on several occasions and toured each of the private properties within the designated Park boundary. The Committee made its recommendations to the Parks Board and they were approved on July 25, 1980. At this same meeting the Board authorized the Director to file a new application with the State Land Department because the reclassification previously filed had been overturned by the Board of Appeals in favor of Mr. Golder. Shortly after the approval to file a new application for the State Land and make offers to the private property owners, staff completed these two items. On July 23,1981, a 19-acre parcel was acquired that provided access from the highway. On August 26, 1981, the Parks Board was issued a 25 year Recreational Lease on 4,692 acres of state land. State Parks also received an appropriation of $368,700 in 1981 for initial construction and $25,600 for aerial photography and topographic mapping. This appropriation was used to secure an additional $231,221 grant from the Federal Land and Water Conservation Fund to assist with park development. On March 11, 1982, Lloyd W. Golder, III filed suit in United States District Court, and sought $2 million from current and former State Parks Board members, the State Parks Director, from current and former State Land Commissioners and a former Acting State Land Commissioner. Golder contended that these people had conspired to take his State grazing land for the creation of Catalina State Park. The suit asked for $750,000 in general damages and $1.25 million in punitive damages. The Attorney General’s Office filed a Motion to Dismiss on behalf of the defendants on April 8, 1982. Judge Rickey of the United States District Court issued a Judgment and Order that dismissed the suit (Golder v. Ramnes, No CIV 82-129 TUC MAR) on June 24, 1982. 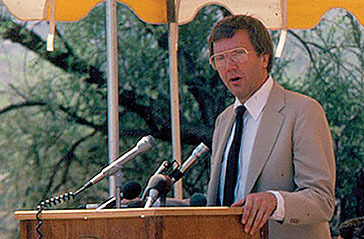 After a complicated series of land trades, leases, purchase of land and initial construction of facilities, Catalina State Park was dedicated by Governor Bruce Babbitt and the Parks Board and opened to the public on May 25, 1983. The Master of Ceremonies was Director, Michael Ramnes. He introduced Duane Miller, Parks Board Chairman, who gave the welcome. Vice Chairman, Priscilla Robinson of Tucson spoke about the hours of citizen participation that had gone into making this Park a reality. She introduced Governor Babbitt who recognized citizens, legislators, the Parks Board, and Park’s staff for their service in making a dream come true with the long-awaited opening of Catalina State Park. Neil Donkersley was the first Park Manager. On April 22, 1991, all of the State land within the boundary of the Park became property of the Coronado National Forest through the Santa Rita land exchange. The Park is managed by State Parks under a Special Use Permits from the United State Department of Agriculture, Forest Service and is 5,525 acres in size. (See Appendix 3). Little is known about the Canada del Oro region and the area where Catalina State Park is located for the periods of Spanish and Mexican control over southern Arizona. 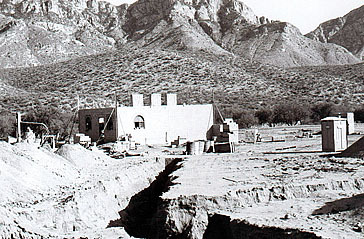 The lack of historical documentation in this area may have been because of the fact that most of the activity in the Tucson Basin at that time centered around the mission of San Xavier del Bac. There was a small detachment of Spanish soldiers stationed at the mission and village of adobes a few miles to the north known as Tucson. Most of the population was concentrated in these centers rather than dispersed, because of the continual threat of attack by the Apaches. Exploring and exploiting the rich mining, ranching and farming potential of the Tucson area was a risky endeavor. In 1853, the Gadsden purchase was signed which formalized the acquisition of southern Arizona by the United States. During the years following the purchase, United States army troops were sent to the Territory to control Apache threats to the increasing numbers of travelers, prospectors and settlers in the area. On of the posts established during this period was Camp Grant located 40 miles northeast of Tucson along the San Pedro River. The route from Tucson to the Camp paralleled the Canada del Oro Wash where it passed between the Tortolita and Catalina Mountains. This route became an important for movement of the troops in spite of the attacks by the Apaches along the Canada del Oro Wash.